he second story with detective Dave Robicheaux. Vietnam vet, widower, recovering alcoholic, Robicheaux is a tough, compassionate man with a keen sense of his own internal contradictions. Dave has turned in his detective’s badge, is winning his battle against booze, and has left New Orleans with his wife for the tranquil beauty of Louisiana’s bayous. But a plane crash on the Gulf brings a young girl into his life — and with her comes a netherworld of murder, deception, and homegrown crime…. A scarce book especially in collectable condition. Posted in Crime Fiction Firsts. Tagged as James Lee Burke. 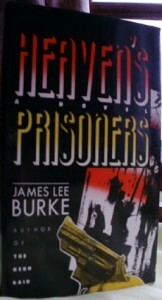 James Lee Burke: Heaven’s Prisoners. New York, Henry Holt, 1988. 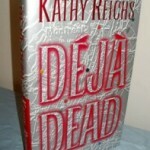 First USA edition, first printing. 10 9 8 7 6 5 4 3 2 1 number sequence to copyright page. Following early attempts at literary fiction and a thriller issued by a university press James Lee Burke found a niche with the Dave Robicheaux detective novel Neon Rain (1987). It was breakthrough that quickly earned him an Edgar for best mystery with Black Cherry Blues, his third novel in the series. This book, like the others in the series is about a deep feeling for the South, human dignity and redemption. The second story with detective Dave Robicheaux. Vietnam vet, widower, recovering alcoholic, Robicheaux is a tough, compassionate man with a keen sense of his own internal contradictions. Dave has turned in his detective’s badge, is winning his battle against booze, and has left New Orleans with his wife for the tranquil beauty of Louisiana’s bayous. But a plane crash on the Gulf brings a young girl into his life — and with her comes a netherworld of murder, deception, and homegrown crime. Suddenly Robicheaux is confronting Bubba Rocque, a brutal hood he’s known since childhood; Rocque’s hungry Cajun wife; and a federal agent with more guts than sense. In a backwater world where a swagger and a gun go further than the law, Robicheaux and those he loves are caught on a tide of violence far bigger than them all…. 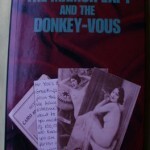 A scarce book especially in collectable condition. Condition: This copy is near fine in same jacket. (FPT $17.95).